This article draws on an evaluation of the effectiveness of the Nurturing Attachments group work program provided by AdoptionPlus for adoptive families in England. Twenty-nine adoptive families participated in a longitudinal quantitative study, completing questionnaires and validated measures before and after group attendance. 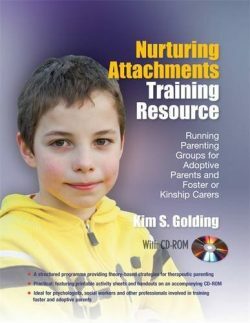 The Nurturing Attachments program, informed by Dyadic Developmental Psychotherapy, was developed to help foster and adoptive parents strengthen their relationships with the child and support children who had experienced developmental traumas. Most parents were caring for children who were late placed and who had complex and overlapping difficulties. Post-training, parents reported increased confidence in their own parenting and statistically significant positive changes in self-efficacy and in their capacity for reflective functioning. However, unexpectedly, adoptive parents identified more children as having greater emotional and peer difficulties and fewer with symptoms of conduct disorders. This article focuses on the relationship between perceptions of adopted children’s behavior and parental reflective functioning (PRF) and self-efficacy. It explores whether improved reflective functioning, particularly curiosity, led to a better understanding of their child’s behaviors and thus an increased recognition of emotional distress. Recommendations for supporting adoptive parents, including the importance of supporting PRF, within a wraparound package of support during childhood and adolescence are made.